The man suspected of slashing another man across the face with a box cutter while aboard a subway train in midtown Manhattan Thursday morning has been arrested, police said. The 44-year-old man, identified as Michael McKenzie of the Bronx, was detained at St. Barnabus Hospital on Friday morning, a law enforcement source said. An employee at the hospital saw the man and recognized him as the suspect seen in surveillance images following the slashing aboard a D train at the 42nd Street-Bryant Park subway station Thursday morning. He was taken into custody and later arrested on a charge of second-degree assault. It's not clear if he has an attorney. Authorities said the suspect slashed a 38-year-old man aboard a Bronx-bound train before it pulled into the station. The bloodied victim then tried to chase the attacker up to the sidewalk, where the suspect made his getaway. 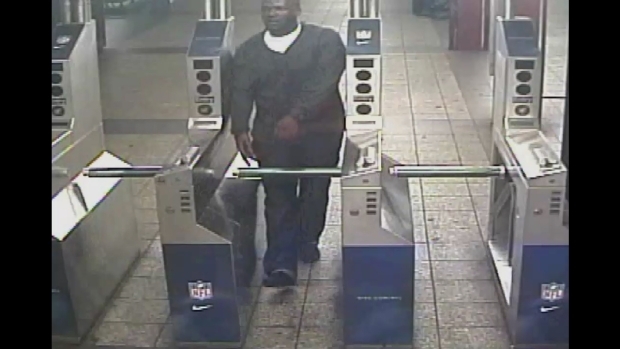 The surveillance video shows the suspect going through a turnstile at the midtown station. Photos from the scene showed a bloodied victim standing in the subway as it stopped at 42nd Street, a shocked look on his face. He then moved onto the platform, bystanders staring at him, and chased his attacker upstairs. "He was standing there and there was blood all over his shirt," said witness Irene Malinoski. Bystanders look at the injured man as he walks across the platform. NYPD Assistant Transit Chief Vincent Coogan said witnesses told police they couldn't tell what they were arguing about. Police say they don't believe the two knew each other but may have both boarded the train at West Fourth Street. Police have recovered the box cutter. Slashings and stabbings on the subway show attacks are keeping pace with last year, about 52 to date in 2016, compared to 53 for the same period last year. They were a more pronounced concern earlier this year in the late winter months, when they were up about 20 percent in March. The NYPD rolled out the "Cutting Edge" operation in response.